For people who are prone to headaches identifying triggers is an important part of pain management. Alcohol is a common headache trigger for those who already suffer from headaches and on top of that, those who are usually headache-free will still suffer headaches from the hangover effect. Alcoholic drinks contain ethanol, which can contribute to headaches through various mechanisms. Headaches begin from blood vessel vasodilation and ethanol can prompt these changes. In addition, ethanol is a diuretic and prompts the urinary loss of several vitamins and minerals, as well as causing dehydration. Headaches may occur shortly following consumption of alcohol or the next morning, with the infamous 'hangover.' Those occurring shortly after tend to indicate specific alcohol sensitivity and are more likely to occur in people who already experience migraines or other such headaches. 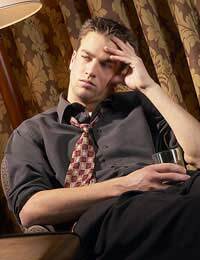 Cluster headaches, in particular, are triggered by alcohol. For some people, it is the precise type of alcoholic drink that causes a headache. A person may experience a headache from one glass of wine but find that he or she can drink several shots of vodka without suffering from a headache. Even within wines, for example, some may find that a glass of white wine causes no problem yet red wine leaves them with an excruciating migraine. Red wine contains tyramine, which is a known migraine trigger and so avoidance of red wine may be necessary for some people. Hydrate yourself prior to drinking with either water or sports drinks. Limit the amount of alcohol you consume to one or two drinks. Avoid those drinks that trigger headaches, such as red wine, for example. Eat before you drink, with a focus on sufficient fat. Fat takes the longest to digest of the macronutrients, and will help to slow the absorption of alcohol. Be extremely cautious the next day if taking any painkillers for your headache, as alcohol still in your system combined with painkillers such as acetaminophen can have dangerous effects. Be sure to drink water to combat the dehydration caused by the alcohol. Many people drink coffee the next morning but as coffee it also a diuretic, this will only increase your dehydration and may also further upset your stomach and intensify your headache. You are the one to decide how much alcohol you can safely consume before you suffer from a headache. You may need to make a note of which drinks seem to trigger your migraines or other headaches. If you are fortunate enough to normally be headache-free, taking a little extra care before, during and after drinking by eating a balanced meal, drinking sufficient fluids and avoiding excessive amounts of alcohol can help prevent a hangover headache the next day. With a little extra effort in looking after yourself, you should be able to enjoy a few drinks and your body will thank you the next day. You'll feel better for it and can avoid those painful headaches. I have been suffering with a constant headache for 22days now and nothing seems to work. Last night while out I had a small glass of wine and instantly my headache got worse making me feel dizzy and nauseous. I have always drunk alcohol and never experienced anything like this, is there any explanation? After suffering with migraine from drinking lager for years.I did wonder if it was a chemical present in certain drinks as I can drink other types of alcohol with having the same effect. Reading these articles have been extremely useful. Thank you.